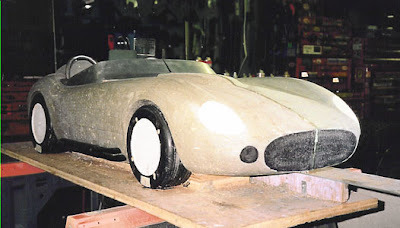 1st picture: Original quarter scale clay model of the body. Its actually a half model against a mirror. The design was changed several times since then but the basic shape was there. 2nd picture: A plaster mold was made from the clay model and several polyurethane plugs were cast from that mold. 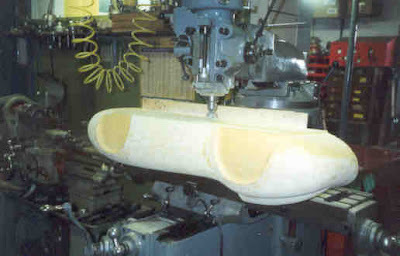 This photo shows one of the plugs being trimmed on the milling machine. 3rd picture: Plywood station buck (full scale) made using dimensions from the plugs which were increased X 4. 4th picture: Front quarter view of aluminum body mounted on chassis. The body still needed a lot of metal finishing work and the car still has the bigger roll bars here. The entire nose tilts forward for engine access. The windshield is from a 55 Ford but cut down. A Lexan replacement is in the plans.